1. Is the Bank trying to make me pay more interest? 2. Is the Bank cheating me? 3. Why is such a big amount allocated to interest and not the principle? The good news is that there is no rocket science involved behind the division of EMI into principal and interest. It’s just a simple math. Let us first understand what is EMI? Why is there a need to calculate EMI? Suppose you take a loan. Can you repay the loan as per your own whims and fancies? The Answer is a big NO. Banks do not have a system to handle so many complex transactions where each borrower can repay the loan as per his/her convenience. So it is important for banks to arrive at a figure which borrower can pay equally every month so that the loan gets repaid within the tenure of the loan. So how is this EMI amount arrived at? Tenure of the loan is 20 years. = (11/100) divided by 12. Applying the above formula, EMI will come to Rs.25, 805/-(Rounded off). The bifurcation of EMI into principle and interest is called amortization. The EMI arrived as per mathematical formula of EMI is Rs.25,805/- out of which Rs.22,917/- is the interest (Refer calculation of interest for 1st month above). The balance amount of Rs.2,888/- will go towards principal. In the second month, the interest will be calculated on Rs.24,97,112/- and not Rs.25,00,000/-. This is because the loan balance at the beginning of the second month is Rs.24, 97,112/-. The EMI of Rs,25,805/- will be the same for the entire tenure of the loan. So balance amount of Rs.2,915/- will go towards the principal. In the third month, the interest will be calculated on Rs.24,65,646/- (Outstanding Loan amount at the beginning of the 3rd month). EMI for each month is Rs.25,805/-. If you continue bifurcating EMI for 20 years the way it is given above, you will find that each month, the interest portion of EMI keeps on decreasing and the principal portion keeps on increasing. This is because Loan amount outstanding is highest in the first month and then it keeps on reducing. Since the outstanding loan amount keeps on reducing after payment of each EMI, the interest portion of EMI also keeps decreasing. EMI will, however, remain the same for entire tenure and the amount of principal at the end of the 20th year will become zero. 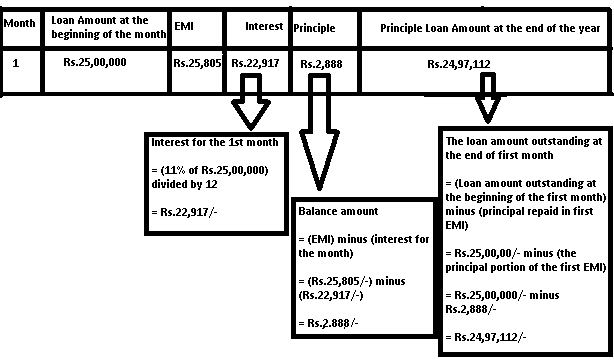 This is how the EMI is bifurcated between Interest and Principal. Having gone through this, now you don't need anyone to explain to you why in the initial period, the major portion of EMI goes towards interest, do you? Nice illustration. this blog made my ideas about home loan very clear. It will definitely help me to compare home loans of different banks. Awesome explanation.After a tiring search I found tjis to be the best. It was really informative, thanks for sharing. I have one doubt, if you could help me with that it would be really helpful. I calculated emi, then bifurcated the principal and interest as mentioned above but on the 240th Month the value of outstanding balance goes in negative instead of zero. Kindly check the calculations below and tell me if I'm wrong somewhere.